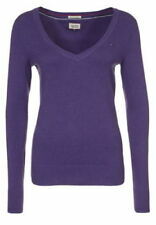 Ladies Tommy Hilfiger Jumper. Condition is Used. Bought from Tommy Hilfiger store direct. The colours are black and white. Condition is used but in perfect shape. Ladies Tommy Hilfiger V Neck Jumper Size M. Good condition from smoke and pet free home, please see my other items :) Dispatched with Royal Mail 2nd Class. Tommy Hilfiger Bright Red Cardigan Size UK Small Approx 8. Condition is Used. Dispatched with Royal Mail 2nd Class. Tommy Hilfiger Ladies Summer Jumper Medium 10 / 12. Condition is Good. Dispatched with Royal Mail 2nd Class. 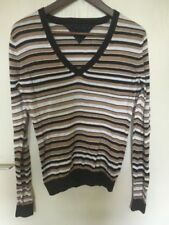 TOMMY HILFIGER Jumper Brown Women's - Size XS * Cashmere Blend*. Condition is Used but great condition Dispatched with Royal Mail 2nd Class. 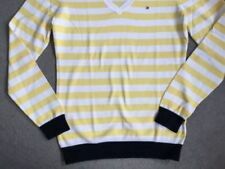 Ladies Tommy Hilfiger Jumper Size Large (12) Mustard. Condition is Used, can tell it has been worn a lot as per pictures but plenty of life left. Dispatched with Royal Mail 2nd Class. Pink Tommy Hilfiger Ladies Jumper - fine knit Very good condition as only worn once. medium in size Dispatched with Royal Mail 1st Class. 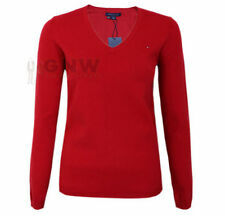 ladies tommy hilfiger jumper. Good condition as only worn a few times - slight bubble under the arm which is shown the in the photos. Xxl in size. Navy blue with white side strip. Dispatched with Royal Mail 1st Class. I have hardly worn this so its in lovely condition. It's a size XL and I am size 18-20. Long sleeved knitwear, not too thick. From Tommy Hilfiger. 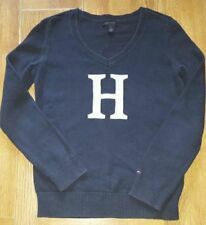 Womens Tommy Hilfiger Jumper Navy Small. Condition is Used. Dispatched with Royal Mail 2nd Class. Tommy Hilfiger Black Cable Knit Cardigan Size XS/XP. Condition is Used. Dispatched with Royal Mail 2nd class. This cardigan has been given to me to sell for our charity and it is in very good condition. It has eight buttons to fasten and it is very soft to the touch. Tommy Hilfiger womens red cardigan/knitted jacket size small. Condition is Used. Dispatched with Royal Mail 2nd Class. 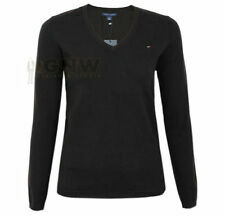 tommy hilfiger jumper medium womans. Yellow and white stripe with blue cuffs and bottom. excellent used condition. Dispatched with Royal Mail 2nd Class. Womens Tommy Hilfiger Coral Ribbed Cardigan XS New. Condition is New with tags. Dispatched with Royal Mail 2nd Class. Tommy Hilfiger Swim Ladies Zip Up Hoodie. This hoodie is in a good condition. It was bought in Florida a number a years ago (about 10 years or so). Hood with pull ties. Zip up front. Elasticated cuffs and hip level. Tommy Hilfiger Black Jumper M. Condition is Used, but only worn twice. Dispatched with Royal Mail 1st Class. TOMMY HILFIGER RED UNISEX JUMPER OVERSIZE SMALL M 8 10 12 OVERSIZE. Condition is Used but excellent. Dispatched with Royal Mail 2nd Class. Tommy Hilfiger jumper in excellent condition. THE BUTTONS DO FIT INTO THE BUTTON HOLES BUT THEY ARE QUITE STIFF-YOU MAY WANT TO JUST SNIP THE BUTTON HOLES A LITTLE TO MAKE IT EASIER TO DO UP. THIS IS REFLECTED IN THE LOW STARTING PRICE. Tommy Hilfiger Designer Jumper, Ivory, size S . Condition is Used. Dispatched with Royal Mail 2nd Class (recorded delivery). Tommy Hilfiger Striped Jumper Size XS. Condition is Used. Dispatched with Royal Mail 2nd Class. tommy hilfiger jumper medium. Condition is Used. Dispatched with Royal Mail 2nd Class.Great conditions! Ladies Tommy Hilfiger Cable Knit Jumper Size Xs/s. Condition is Used. Dispatched with Royal Mail 2nd Class. Tommy Hilfiger Ladies Red Cardigan In Good Used Condition. Condition is Used. Dispatched with Royal Mail 2nd Class. Lovely Ladies Tommy Hilfiger white jumper in size small. Lovely Ladies Tommy Hilfiger white jumper in size small. It it so lovely and soft , not thin but nice and thick- cotton. Worn maybe 2-3 times- clean and in very good condition- just a little bit bobeling but nothing very bad - see photos. Looks great on . From smoke free home. UK only and no returns please. Dispatched with Royal Mail 2nd Class. Tommy Hilfiger Cable Knit cardigan,size S.In good condition. Great classic jumpers for wearing over a T-shirt etc. - Tommy Hilfiger logo embroidered on chest. - one pale pink, the other cream (very on trend for SS19: ice cream colours; beige). The pink jumper has a small stain on the back of the right sleeve, near the cuff. tommy hilfiger Ladies Chunky Knit Grey Cardigan Size Small. Really good condition please see my other listings . Dispatched with Royal Mail 1st Class. Sweatshirt / jumper. TOMMY HILFIGER. Has been worn but still in great condition. Women's HILFIGER DENIM Open-Front Cardigan, Size S, VGC !